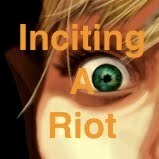 Episode 47 of Inciting A Riot: the Podcast takes a look at the placement of altars, as well as discusses a new Seeker’s Riot that will be undertaken for 2011. All I have to say is THANK YOU for your grip department! I 100% approve. I especially approve of unemployment, people saying there aren't any jobs out there (I've been out of college for a year and I don't have my dream job, but I'm not about to not work and therefore go into debt! Well, deeper than I already am. Thank you college! ), and people saying they're poor but spending tons of money. Hopefully we can do away with these things this year. Though I mostly disagreed with you about the "don't love your body" segment, I think you do have a point about health. I just don't think shaming people or judging them based on their looks encourages them to be more healthy. I think it actually does the opposite. Also - your point about makeup is very 80s "makeup-is-an-apology-for-your-face" feminist of you - but I think the real issue is that women feel (are made to feel) the need/necessity to wear makeup whereas most men don't. Women (especially straight women) are told hundreds of times that they are valued for their looks, for their bodies, only or primarily. It's not a discussion about "health" so much as its a discussion of personal worth - a discussion often thinly disguised as one regarding health. Men (especially straight men) don't have to be attractive to be deemed worthy enough to be listened to, valued, loved or fucked. I don't know the statistics, but I would be very surprised if straight men get nearly as much plastic surgery or hair removal or beauty supplies as straight women do - and I think that has everything to do with the differences between how a person's worth is determined based on gender. If gender equality ever happened, I would think (straight) men would try just as hard as (straight) women to be physically attractive - or that (straight) women would stop trying any harder than (straight) men to be physically attractive. But with all that, I'm a fat femme lesbian who hasn't shaved her pits in a month. The two-pronged issue of the body embracing is definitely that. Although I agree with Zarza on the societal values placed on unattainable "beauty" I do think that as a whole we have gone WAY opposite of the overly obsessive “thin is never thin enough” attitude of decades like the 80’s. These days in young people it seems to be the norm that if you don’t have something hanging over your hipster jeans, you aren’t “loving your curves” or “accepting yourself just the way you are”. Those are not curves. That is fat and it WILL shorten your life. This is the difference between societal pressure and true medical and health factors that are telling us that our children will be the first generation to NOT outlive their parents. There is a difference between accepting your flaws and just not caring. The not caring is what we are seeing a lot of today. That said, I get sick to death of people insisting on defining for me what is acceptable in the way of beauty, health, fitness and body image. It goes both ways. You have society and Hollywood telling you to aspire to these unattainable standards and you have a backlash of “flaw accepting” women, yes and it is mostly women, trying to tell me that I should be ok with looking like a little round Goddess figurine. I’m not ok with that and I never have been. Even though THAT is exactly what my body would aspire to if I “accepted her flaws”- as I am told I should in order to be a good feminist, Goddess loving, authentic witch. And, don’t question me on the eventual outcome of my body – you haven’t met my mom. My point is, it wasn’t society that forced my preference for clean lines and lack of cleavage onto me. THAT was my choice made as a very young child because I was simply aware of my body and those around me and what they could do, couldn’t do (due to being overweight) and I made up my mind I did not want to be in that situation. We all should strive to be happy with ourselves yes but at the point where a person’s health is in peril or my pocket is in peril because all the people “embracing their flaws” are driving health care costs through the roof I draw the line. Great show as always Fire Lyte!